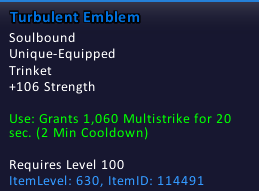 I completed this mission today and the item that it gave me had severely under-budgeted stats despite it still being ilvl 630. Most classes will not find this trinket useful unless it's replacing a rather low-level trinket, even if it gets a better item budget as most trinkets received from Turbulentes Schmuckstück have a rather low budget, and Multistrike is just not important enough to most of the classes that can receive this item from a Turbulentes Schmuckstück. For such a high ilvl (or... "high" rather), it hasn't exactly got the best of stats. The ilvl 615 one (Freigiebige Fesseln des Zorns) is way better. Shame it is unique-equipped. It has an 'on use' effect, a lot of the stat budget went there. To demonstrate how under-budgeted this item is, compare it to this BRF trinket: Phiole der Schattenkrämpfe. Both have passive str and on-cooldown multistrike (same times even, 20sec on 2min CD), yet when scaled down to ilvl 630 it has 125 more str.